From an aesthetic point of view, the style of the E-PL3 shows the most significant update of any Pen model. As before, it is available in black, white, silver and red, but the body is smaller and has a distinctly more modern feel. The front surface is smooth and slippery and, with no grip to speak of, the thumb pad on the rear is heavily relied upon. 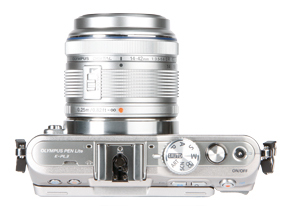 This slick design is something of a departure from the classic retro feel of an Olympus Pen, and nods more towards the compact Olympus XZ-1. Whether or not this detracts from the camera’s appeal is down to personal taste, but I for one miss the old charm. Weighing 265g (body only) and measuring 109.5×63.7×37.3mm, the E-PL3 is the most compact E-PL model yet and virtually the same size as the XZ-1, although a little heavier. A new design does see the lens mount protrude an extra 10mm in depth, however. As already stated, an external flash is included instead of a built-in unit, presumably – as with the Sony NEX-5 – to make the device as small as possible. The flash complements the new style of the camera, and flips up into a forward-pointing position. It connects via a hotshoe and an accessory port, and is able to communicate wirelessly with other flashguns. And the similarities between the E-PL3 and the Sony NEX-5 do not end here: the E-PL3 also introduces a tiltable LCD screen into the Pen range for the first time. One slight frustration, however, is that the sensor does not correctly orientate the files, so portrait-format images will need rotating post-capture.